I thought a non-ranting-at-PokerStars-SNG-changes post was in order. I'm getting a little sick and tired of all the changes and debating, and you're probably sick of me going on about it all. As I've mentioned before, I've had a couple of sessions with Mental Game coach Jared Tendler over the last two or three months, which I feel have been very productive. I blogged about our last session a few days ago, but now Jared has posted up the audio for it, so if you are interested in hearing it for yourself you can download it here. I got a nice mention in Barry Carter's blog recently (aside from him suggesting I look twelve, when I am infact 26, thanks for that Bazza). Although we've only met in person a couple of times, Barry has been someone who has looked out for me over the years ever since I got to know him through the Blonde Poker forums (perhaps it's because he's 31 and I'm 12?). I am really pleased for him that his new book with Jared has hit the shelves. He seemed pretty chuffed getting his hands on the hard-copy for the first time. It must be a wonderful sense of achievement for both of them. Any sense of achievement I have gets spent on nappies and take-away, so to have something tangible that a lot of hard work and dedication went into must feel pretty satisfying! Speaking of their book, The Mental Game of Poker, it arrived in the post a couple of days ago :). I have only read half of the first chapter, which is the Introduction, but it already looks very promising and I can't wait to get stuck into it. I know this sounds kinda lame, but I really like the font they chose! I'm sure this isn't the best part of the book. Jared once asked me, "When you look at a weather forecast, and it says it's going to rain, do you get mad when you go out and it's raining?.. So why do you continually get angry when you know variance is going to happen? The next time I feel the urge to shout and swear at the computer, bang the computer, and tell my opponent to f** * right off, which is something I do when I'm having a bad day or whatever, I'm going to remember this piece of advice from Jared, and perhaps it will chill me out a bit (and prevent me from teaching my 20-month-old son some choice catchphrases). I randomly decided to watch Rounders for the second time the other day. It's cool how it was made in 1998 but it still stands up as a really good film today. Okay, some of the poker itself is a bit dodgy (for example, I believe Mike McDermott, the character played by Matt Damon, open raises for 20 times the big blind with KK whilst playing heads up. WP sir), but considering the huge evolution of poker since it was made, it isn't too bad. There are definitely some similarities between Mike McDermott and my old self. I risked my degree to play poker (and like him, inevitably dropped out). I would take shots that were way outside of my bankroll. I was always thinking about the glory of becoming a famous poker player. However, these days I pride myself on being much like the character Joey Knish. Poker is the means of supporting my family, and that is the most important thing, so taking any undue risks just isn't an option. Although Knish gets looked down on a little for his 'all grind no glory' way of life, I am so much happier now grinding it out like Knish than I was facing the swings of McDermott. Having said that, it seems that every month a UK player who I'm friends with, or at least know, has some sick success in live tournaments. Be it James Dempsey, Stu Rutter, John Eames, Toby Lewis, James Keys or, just recently, Rupert Elder. I do get the odd hint of jealousy, and perhaps wish that could happen for me one day. It's only a fleeting thought though. If I get the chance to take a few shots in the future, then that's cool and who knows, one day maybe I'll bink something. For now though, I'm happy enough just grinding out a living, and trying to build my life bankroll as well as my poker one. 11 Comments to "Joey Knish..."
Interesting Audio, Some thought provoking ideas made by Jared. Im sure u will step your motivation! Also on another note your tracks were pretty good. Do you still have that truck? Is referring to me as a 32 year old some sort of strange rubdown (as I am 31,so it seems like you are destorting my age but not by enough)? @Barry I flicked onto your facebook for you DoB, obv didn't check the month, sigh. @Kevin, lol. Perhaps I'm not exactly the same then. re the last para. Or like entim who should actually just shove every single hand at the moment the heater he's on. jealous much? I'll take one day of that let alone 6 months. @DM Yeah I very nearly mentioned Entim. Sicko. I have the book on order and am looking forward to its arrival - there is so much to do with being in the right mental state and knowing how to control it playing poker. Yeah I've just started mixing some 6-maxs in. Not sure if I'll continue to do it or not. Think I have a bunch of leaks but am doing ok so far. Gl at the tables. O.k., nice. I think it's good to diversify, as mixing in some different formats can definitely improve your game (though I'll probably stick to being a 6-max donkey :). Next time I'll pay extra attention and let you know what leaks you have lol. I too am much more keen on looking at ways of becoming a steady-income producing grinder at STTs, rather than a glory-hunting MTT player and would be happy if I can get anywhere close to this. 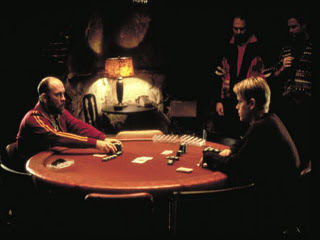 I think 'The Mental Game of Poker' is next on my book list and I have to get a copy of Rounders too; I've never watched it yet!